Win one metre of Easter eggs! 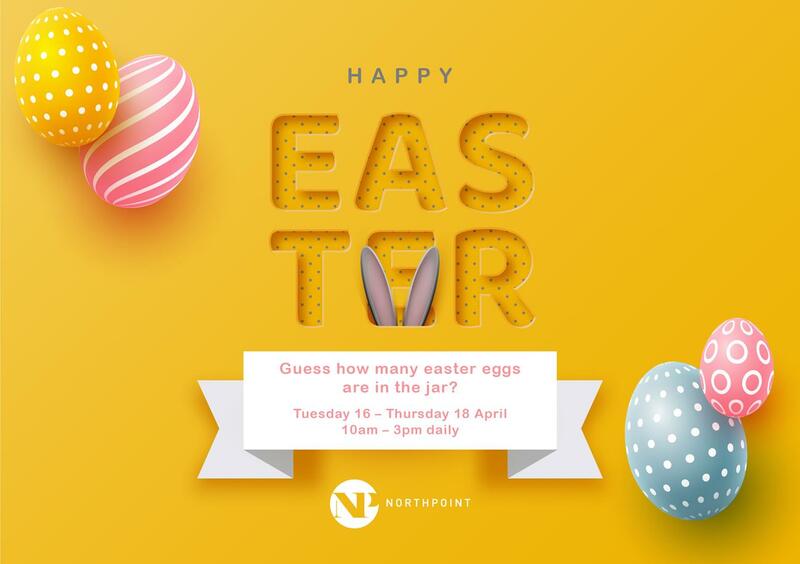 Simply visit our Northpoint Easter Bunny in the building foyer to enter. Forget guessing what a bunny and chocolate eggs have to do with Easter – nobody knows. But anybody can guess exactly how many chocolate eggs are in these 1 metre vases, and if your guess is correct – you win the vase and all the eggs! There will be a winner EVERY day from Tuesday to Thursday. Just for entering (for free) you will receive at 10% voucher at multiple retailers and you could earn yourself a Lindt chocolate bunny. P.S The vases change every day so if you don’t win, don’t forget you can come back and enter again tomorrow!